Along with the many advantages offered by the relatively recent advent and maturity of Class-D/Switching amplifier technology, a new set of performance-limiting issues have arisen that were never much of a concern with former linear (Class-A, A/B, etc.) amplifier designs. At the root of the matter lies the fact that the technology is based on the principles of Pulse Width Modulation (PWM). Principle of the delta PWM. 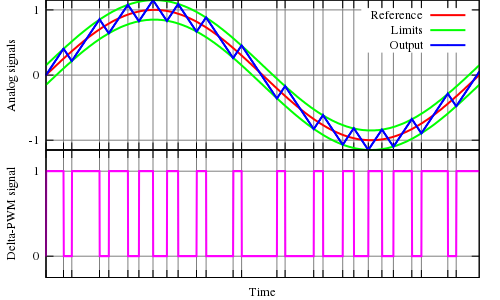 The output signal (blue) is compared with the limits (green). These limits correspond to the reference signal (red), offset by a given value. Every time the output signal (blue) reaches one of the limits, the PWM signal changes state. 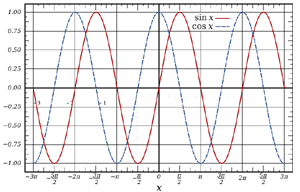 In the PWM topology, analog music signals are ultimately converted to a series of Square Waves, wherein the width thereof is varied in direct proportion to the magnitude and frequency of the analog audio waveform. While there are many different forms and implementations of of the general PWM approach with each offering its own unique set of advantages and disadvantages, the one factor they all have in common is the resulting square waves that are generated as a necessary byproduct of the process. Another aspect of the PWM process is that in order to achieve the accurate reproduction of a given frequency or music waveform, for each square wave cycle the audio signal must be "sampled" at a rate known as the Nyquist frequency. Signal sampling representation. The continuous signal is represented with a green colored line while the discrete samples are indicated by the blue vertical lines. In practice, the Nyquist sample period (or 1/period = frequency) must be a little more than twice the frequency of the audio signal being converted by the PWM process. Seeing that the highest audio frequency humans can perceive is approximately 20KHz, this means the sample frequency must be at least 44.1KHz. This also just so happens to be the same frequency as the common "Red Book" Compact Disc format uses to digitally encode audio signals. Although, 44.1KHz represents the absolute minimum frequency at which a 20KHz audio signal must be sampled. So, in an attempt to produce products of even greater fidelity virtually all amplifier manufacturers work to exceed this limit by as much as modern electronic component design and/or transistor technology will permit. As a result, it is now not uncommon to find amplifiers being offered that employ sample frequencies as high as 600KHz and beyond. 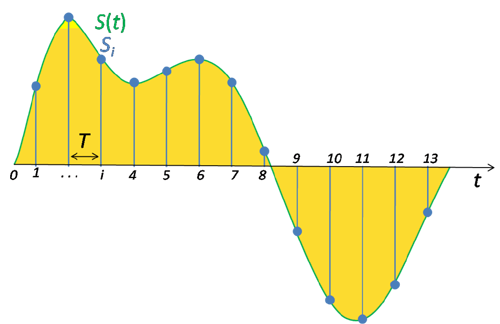 The graphs of the sine and cosine functions are sinusoids of different phases. ... but few may realize that a square wave can be constructed from a combination of sine and cosine waves. That being the case, a square wave can also be broken down into a combined series of the same by a mathematical process called the Fourier expansion. See the image below for a partial representation thereof. As one can see above, a square wave can be constructed from a series of sine waves comprised of the fundamental frequency (1) of the square wave we are starting with (say, 1KHz) and a series of odd-ordered harmonics (3, 5, 7, 9, etc.). Although the above image only shows the first four components (1, 3, 5 & 7), in theory a "perfect" square wave would be comprised of an infinite series of odd-ordered harmonics extending out to infinite frequency. By "perfect" we mean a square wave that has rising and falling edges that are infinitely fast, such that no time is required to transition from one level to the other. In reality there is no such creature, as all operations and actions in the physical universe take some finite amount of time to occur. Nevertheless, as the fundamental frequency of the square wave increases, the rise and fall times of its transitions decrease and asymptotically continue to do so in an approach towards infinity. That said, high frequency square waves, such as are encountered in PWM-based amplifiers, represent a set of combined frequencies that actually extend well into the Mega-hertz region. Please reference the image below for an example of a simple 1KHz square wave. Based on the example above, if instead we start with a 500KHz square wave as might be employed by a hypothetical PWM amplifier, then we find that the 20th harmonic would be equivalent to 500KHz x 41 = 20.5MHz! If we start with 800KHz as is employed in NuPrime and other such similarly advanced products, then we are looking at harmonics extending out to 32.8MHz and beyond!!! Being based on the speed of light, the Wave Velocity (propagation speed) of a 32.8MHz signal is approximately 186,282 miles per second and translates to a Wavelength of 360 inches. Now, lets assume a 1/32nd wavelength transmission line (,i.e., a simple piece of wire). All it takes to transmit that 32.8MHz signal as a Transverse EM wave (i.e., a Radio Wave) is a simple piece of wire 11.25-inches in length. Likewise, a 64th wavelength transmission line would only require a wire 5.625 inches long. Granted, being 1/32nd or 1/64th transmission lines, these wires won't be efficient transmitters such that much energy will be transformed into radio waves, but when confined inside a metal chassis and in close proximity to each other, to some degree all wires and cables are subject to the possibility that they will become the equivalent of either transmitting or receiving antennas... or even both at essentially the same time. From the above it becomes clear that PWM-based amplifier technology has one major weakness - itself. That is to say, the very signals it generates and uses to operate become potential sources of what one could call "self-contamination," such that those signals can become "airborne" in the form of Radio Frequencies (RF). Being essentially "trapped," this RF radiation can effectively "bounce around" inside the metal chassis and ultimately be picked up (received) once again by either the same piece of wire that transmitted them, or others within the same chassis. Once received they are then "injected" back into the same circuitry that generated them in the form of new electrical currents and voltages, but now delayed in time and in different locations within the circuitry than from whence they came. In fact, every metal conductor or small metallic component within the chassis can become a transmitter and/or receiver of this unwanted RF energy. Furthermore, due to the electrical properties of Inductance (L) and Capacitance (C) exhibited by the wires and other circuit components, once received this energy can resonate and/or "ring" at any frequency associated with the "Time Constant" of the L/C properties of the resonant modes of the pieces and parts involved. In summery, combining all of the above we arrive at a condition of extreme complexity with respect to the RF radiation profile that exists inside the metal chassis of virtually any given PWM-based amplifier. In fact, the RF profile can be so complex that it might well require using the equivalent of a Cray super-computer to model and analyze. Whether or not that's actually the case is somewhat irrelevant though, as the environment inside the chassis of these amplifiers is sufficiently complex that their designers are not able to anticipate the RF profile toa sufficient degree that they could possibly compensate for it within the circuit design. Rather, they simply build a prototype and if the design is stable enough to produce acceptable audio measurements... "when in doubt, ship it out" becomes the motto that rules the day. If the results are otherwise, then they attempt to change the layout of the circuitry and wires a bit and/or shorten the lengths of the wires that are used to connect everything together until the assembly of it all meets their basic design requirements. To be sure, going to lengths that involve the use of standard accepted practices of shielding and grounding that have been proven to virtually eliminate the problems at their source (the wires) is always a last resort due to the large amount of manual labor required to do so. Otherwise, they will inevitably be forced to raise the end cost of the product to the consumer, and thereby run the risk of incurring a reduced sales volume for the product that is likely to result. While doing so will likely increase the performance of the product substantially, due to the fierce competition in the marketplace ultimate audio performance is not the primary goal of most high-end audio manufacturers. If a given sales volume cannot be achieved to offset the manufacturer's operational overhead while also generating a profit, then the product simply will not be produced. And so here we are - as this is where TDSS and our upgrades come in. While not necessarily a service that will appeal to the more "average" audio consumer, there are those that truly seek the greatest degrees of audio performance that can be had. As a response to this desire, without a doubt there are plenty of manufacturers out there that build products to meet such demands, and most will agree that they do so at substantially higher prices than what the vast majority of devout enthusiasts can reasonably afford. Therefore, this group of individuals finds it a far greater challenge to assemble a system that is able to deliver a level of performance that is near unto that which the more "well to do" enthusiast is able to achieve. WELL... it is for THOSE individuals that we offer our services. Expending the extra time and effort required to correct the issues outlined above along with including other treatments that help to reduce several other sources of audio product distortion, we are able to transform more affordable products into those offering genuine world-class performance. Furthermore, seeing that we have nowhere near the large overhead that most manufacturers are faced with, we can also offer these services at a very reasonable cost. As a rule you will find that the initial cost of a well designed but more affordable component combined with the cost of our upgrades will result in a product that often delivers a level of world-class performancethat is a fraction of what would otherwise be required to purchase the more elite "cost is no object" products being offered by manufacturers at the extreme end of the market. In other words, if you want the "most bang for your buck" you just can't beat the results achieved by having TDSS upgrade your "already quite good" audio components. Basically, this is because instead of factoring in a bunch of overhead, 95% of what we do brings real added value to such components, and hence... to your ultimate listening enjoyment.